Credit for this simple STEM light table activity for kids goes to four year old J. He came up with it all on his own and it ended up leaving boys laughing hysterically. They were just so excited about it all! It was so simple, yet completely engaging for a toddler and a preschooler. And it even gave us a chance to discuss and explore basic physics. 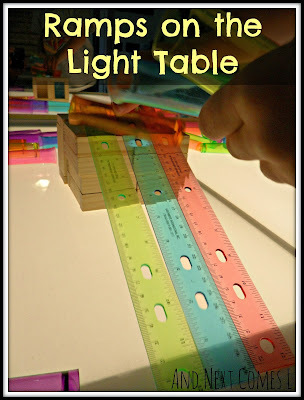 J started building a ramp using translucent rulers by leaning them against our homemade color blocks. He then started rolling some tube shots down his "slide," as he called it. Line the up! Let 'em go! Like I mentioned, both boys thought that these ramps were an absolute blast! And I loved watching them giggle like crazy time after time. You're welcome! I am so happy that we finally built one as we use it for hours every single day.